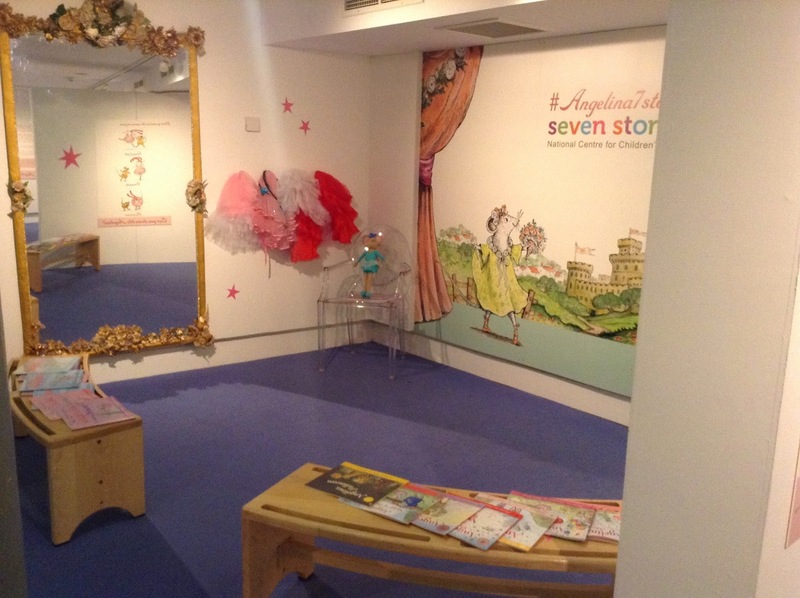 Welcome to the Storylab Gallery and the exhibition 'Twists and Tails - The Story of Angelina Ballerina'. My name is Sarah McGlynn, and I'm the new Exhibitions Assistant, newest member of the Collections Team. I was excited to get started on the installation of this exhibition, we had been working on it since before I arrived in May and now the date had arrived. 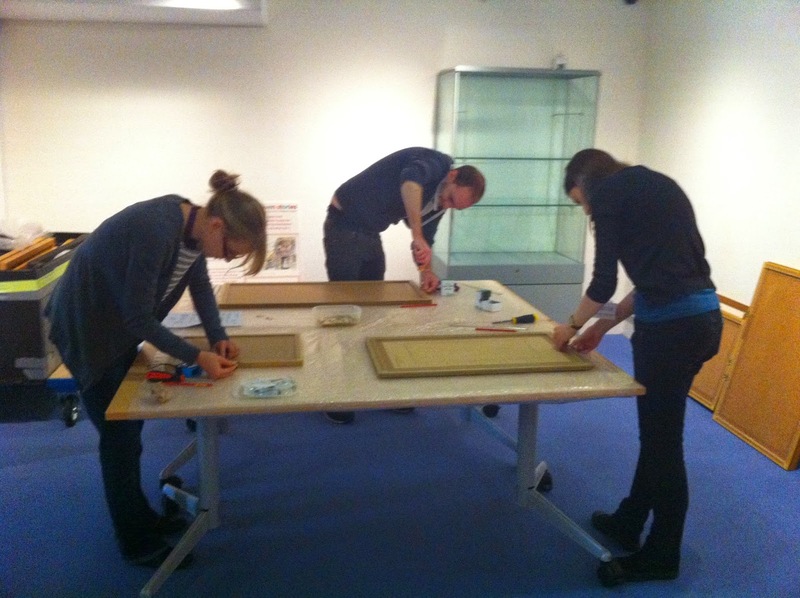 For three days last week most of the Collections Team were involved in the hanging of this exhibition. On Monday, after dismantling and packing the Picturebook in Progress exhibition we then prepared the gallery by filling in holes and repainting the walls so that the space looked brand new again. 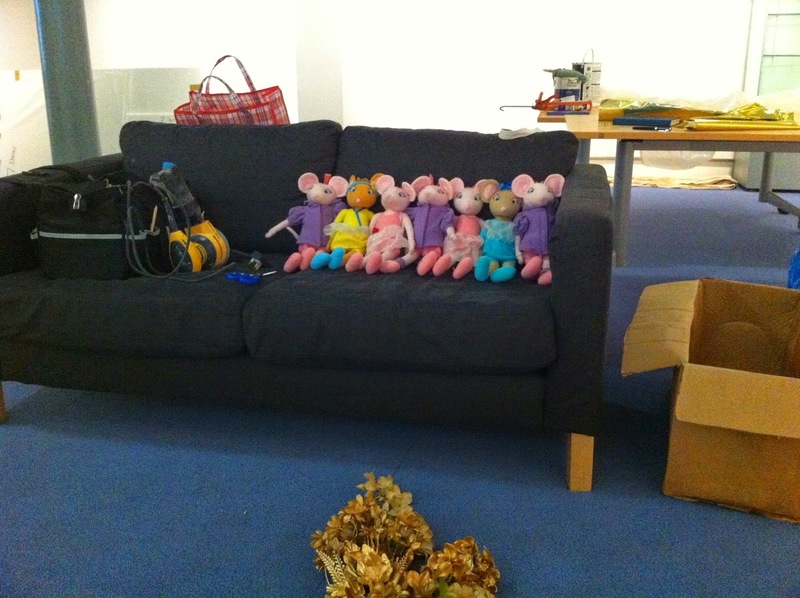 Hanging exhibitions is best done methodically and the team worked closely according to our schedules, we did invite some extra helpers but they remained firmly seated on the sofa. 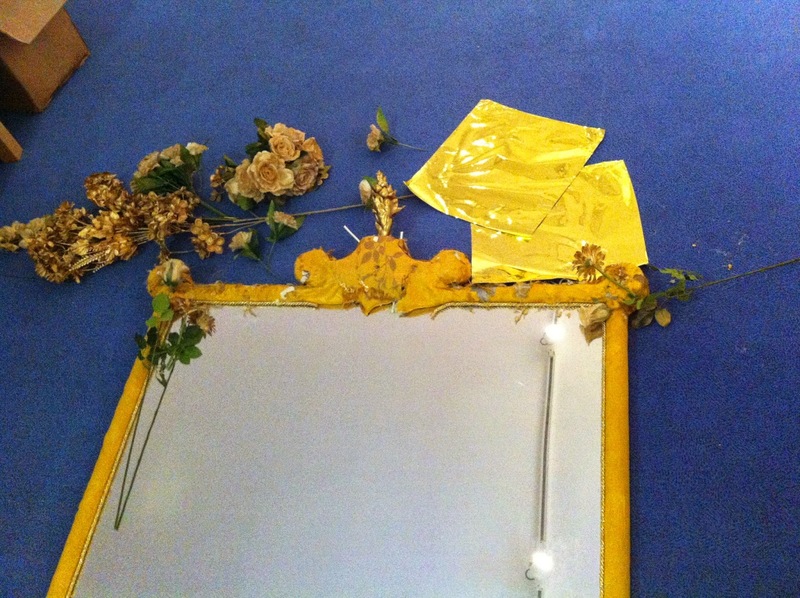 I spent Tuesday customising a large mirror and transforming it into what would hopefully become the centrepiece of every little mouse's experience of visiting the exhibition. Due to the delicate nature of the artwork, we have to keep light levels at 50 LUX; this meant that the photopoint, which has recently become a prerequisite for exhibitions, had to be placed well away from any original artworks. 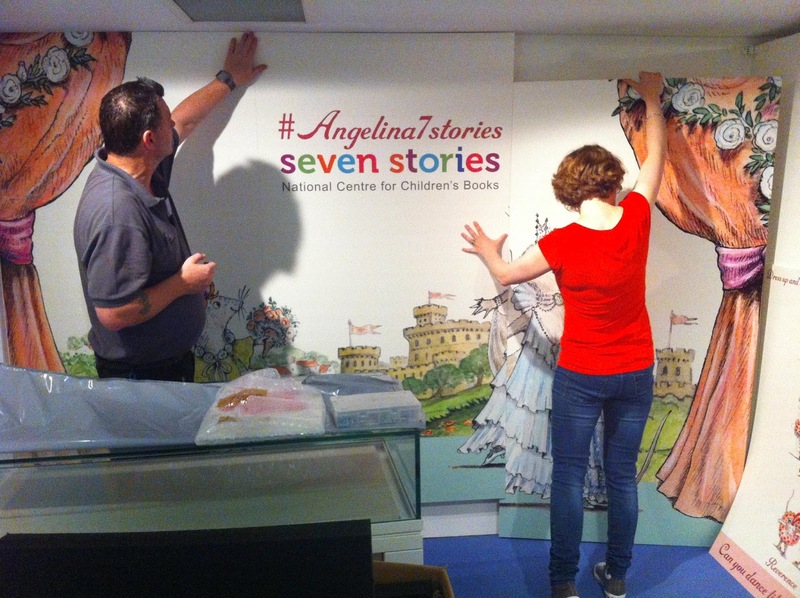 We decided to have the mirror as a central part of this area so that visitors could dress up, see themselves in the mirror and then have their photo taken in front of the Angelina wall graphics. The original artwork and correspondence from Helen Craig and Katherine Holabird had been framed and was ready to be mirror plated before installation could take place. Whilst mirror plating, we were able to take the measurements of the frames and prepare to make the calculations required for hanging. The exhibition had been carefully curated in advance and the layout went according to plan, using some double hanging, there would be exactly the right amount of wallspace for the works chosen. At the same time as we were hanging the artworks, Lindsey, the Seven Stories conservator, was carefully placing objects in the display cases on mounts specifically made from archival mount board. Simultaneously the graphics both large and small were being sited and fixed to the walls. The original artwork is very beautiful, tiny and detailed so we used large graphics to complement the artwork and give Angelina a presence in the room from a distance. With the addition of pink labels crediting the artwork, a sprinkling of pink stars, generous piles of Angelina picture books and drawing activities, a plain room had been transformed into a delightful space filled with gems of information and a truly wonderful place to spend time. 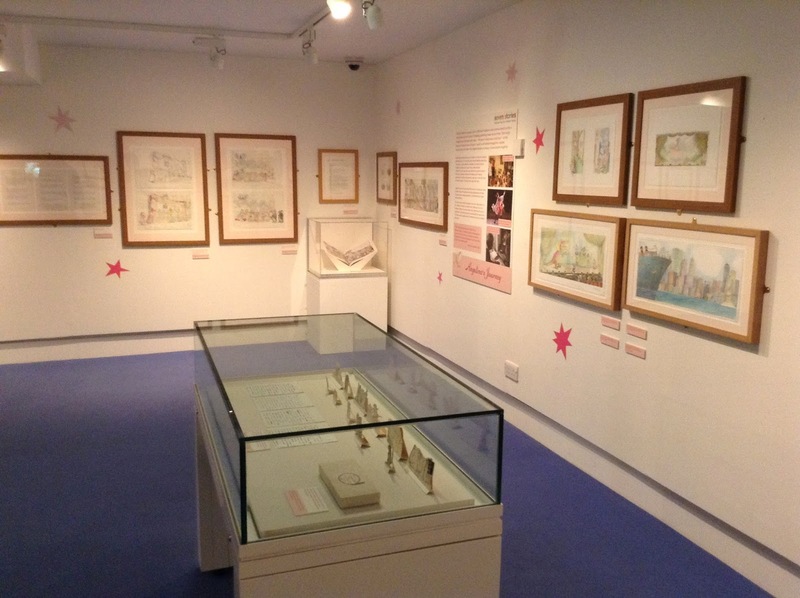 When Helen Craig and Katharine Holabird donated their archives of work for the Angelina Ballerina series, the exhibition team wanted to put the material on display as quickly as possible. Not only does the archive represent one of the most popular children's series of the past thirty years, but the level of detail available from both sides of the page is wonderful. Kris (Seven Stories Archivist) and I (Alison, Curator) identified three main themes visible in the archive and stories. The first was 'How to make an Angelina book'. One of the most crucial parts of the archive, and Seven Stories mission, is to make visible the process of creating a book. This material gives us the chance to show the long development that goes in to creating each book; showing the involvement of not just author and illustrator, but editor too. Kris and I worked through all the books represented in the collection, and chose Angelina and the Princess as the most visual example of this process. The second book in the series, published in 1984, it was written while the concepts behind Angelina and the world of Mouseland were still being developed. There is also a complete run of preparatory work, in which alterations to the story are clearly visible. What we found most intriguing was the evolution of the original story from Angelina performing for 'The Duchess of Mouseberry', to performing for the Princess. The material on display allows the viewer to track the changes made through the whole process. 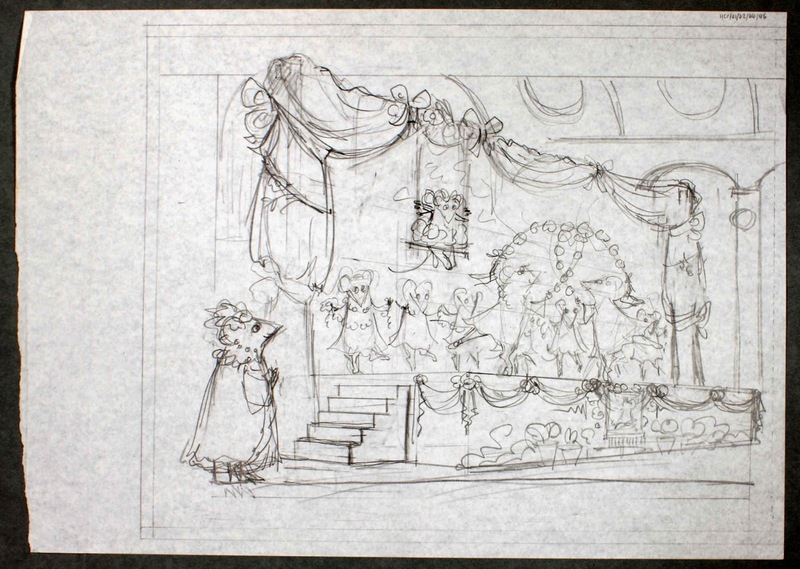 To represent the illustration side, we chose to focus on one particular scene from the book - the double page spread of Angelina performing for the Princess. For this there were many rough illustrations created by Helen Craig, complete with notes to herself about composition. It is an interesting exercise to decipher which elements have changed between each draft, and work out which came first. 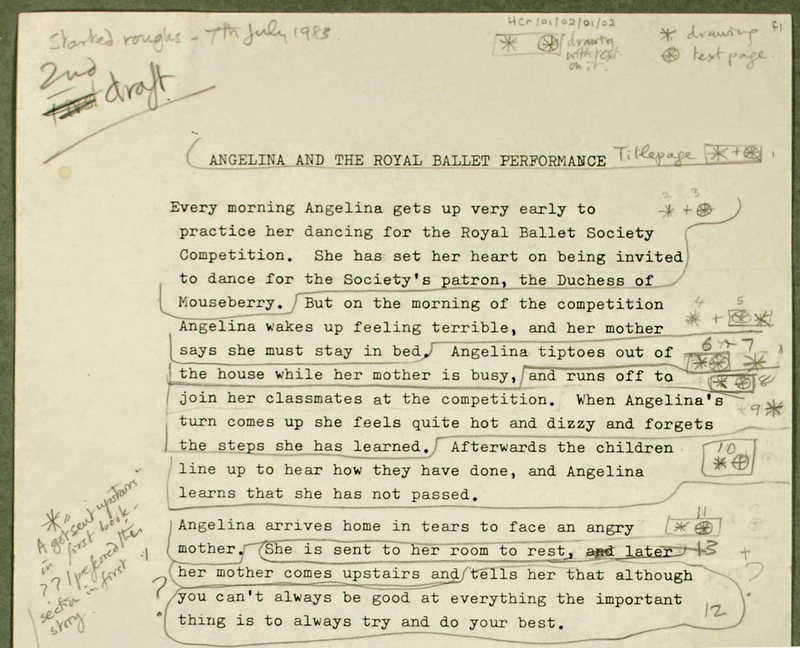 The second theme most apparent in the archive is that of Angelina's journey, both within the books, but also from initial picture book to global star. 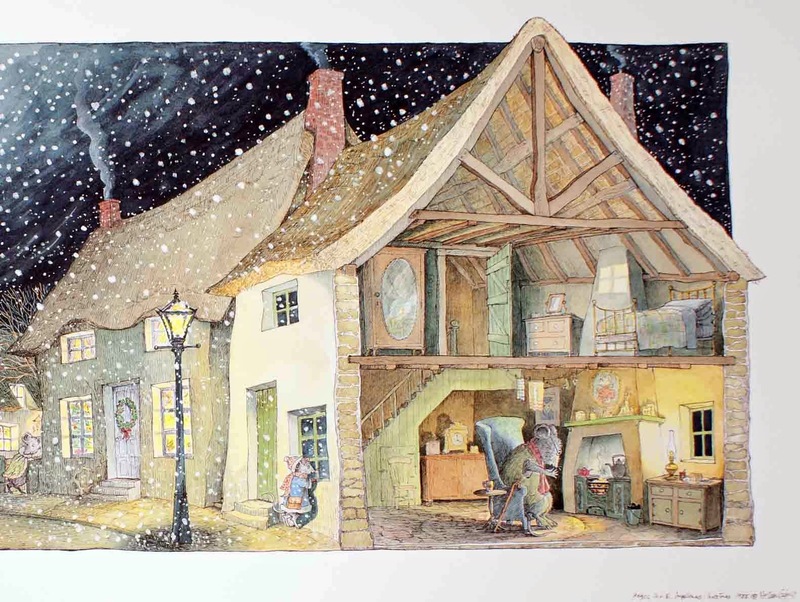 The archive holds the very first illustrations and manuscript created by Helen and Katharine. Although different to the final version, these show the very beginnings of Angelina, and are on display alongside each other. Showing Angelina's journey within the books led us to choosing some of our favourite Angelina moments, including when she is preparing to go to her first ballet lesson, performs for royalty, and when she meets her new baby sister for the first time. We also have on show an illustration from the (as yet unpublished) latest book in the series Angelina's Big City Ballet, of Angelina and her family arriving in the Big Cheese (aka New York). Small section of the first draft, which later became Angelina Ballerina. Katharine Holabird, 1982. We also follow Angelina's journey to international fame. The archive contains material from Katharine and Helen's initial and ongoing discussions with HiT entertainment, who hold the licence for the Angelina Ballerina brand. This correspondence often shows the frustrations of allowing other people to work on a character the creators care deeply about. 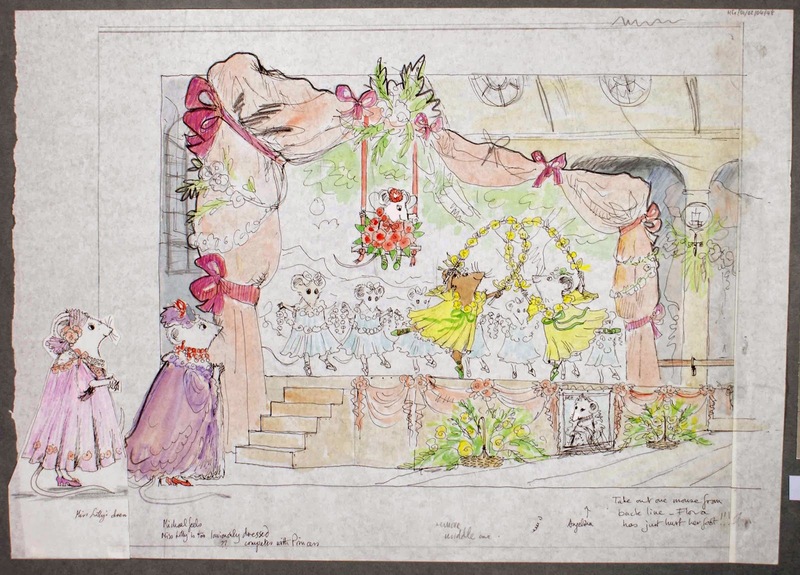 There is also an opportunity to display material from the many different spin-off's, such as the English National Ballet adaptation, much of the merchandise produced over 30 years, and examples of the two television animations. Probably the most fun we had was choosing content for this section. The world Angelina inhabits is called 'Mouseland', and comes set with certain rules. 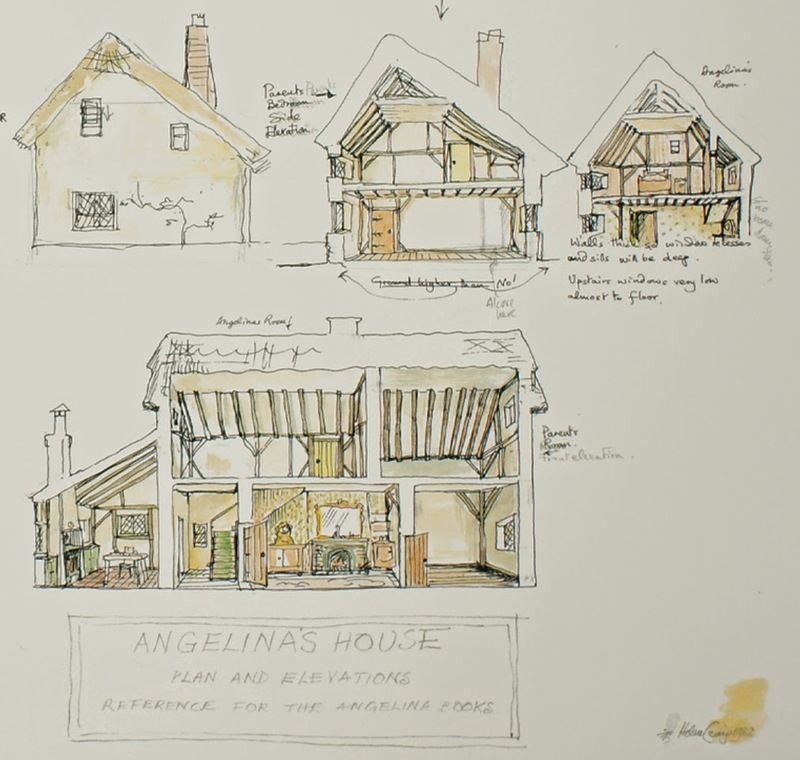 It was wonderful to explore this within the illustrations and Helen's rough work, uncovering hitherto unseen floorplans of Angelina's home, and choosing pieces which help to show the detailed world the mice inhabit. 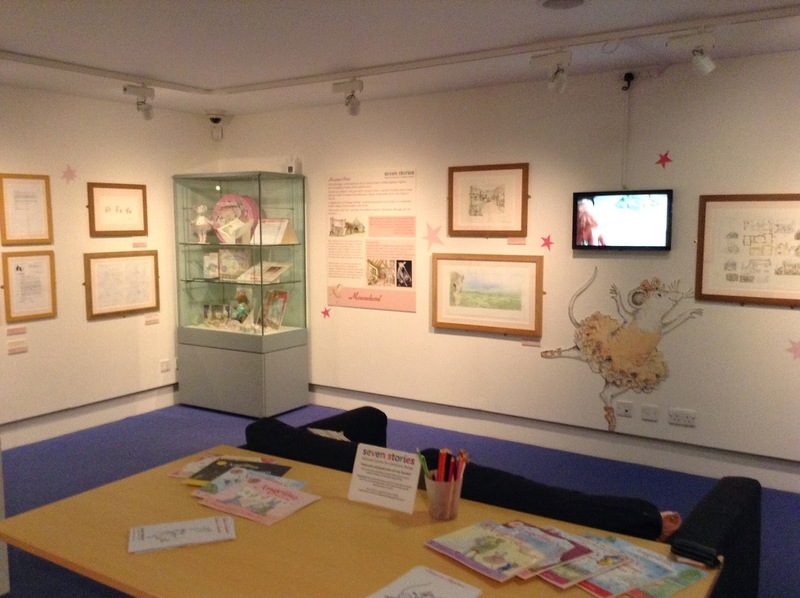 If you would like to visit the exhibition, it will be on display from Saturday 19th July 2014 until April 2015, at Seven Stories, National Centre for Children's Books. Click here to find out more details about visiting the centre. If you would like to book a visit to research the archives within our collection store, click here for further details. 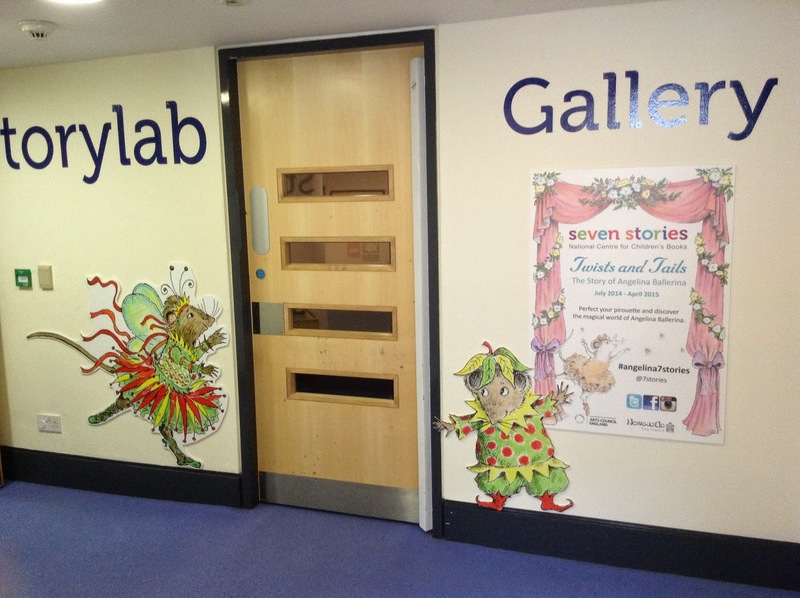 Interested in other posts about the Storylab Gallery at Seven Stories? Click here or here. Angelina Ballerina is now published by Puffin Books, and are available for sale from the Seven Stories bookshop, one of the largest independent children's bookshops in the UK. In 2012, a collection of work by the author and publisher Kate Petty was kindly donated to Seven Stories by Kate’s daughter, Rachel. Kate Petty, who sadly died from cancer in 2007, wrote and published hundreds of children’s books on a huge range of topics. The collection here at Seven Stories contains a wealth of material including notebooks, drafts, preliminary art and layouts, dummy books and correspondence, giving an enlightening and extensive insight into how she worked and developed her ideas. Kate Petty began her career as an editor of adult books for Jonathan Cape and Phaidon. She carried out various editing, copyediting and proofreading jobs for other publishers, working on titles such as Rites of Passage by P.D. James and The Restaurant at the End of the Universe by Douglas Adams. 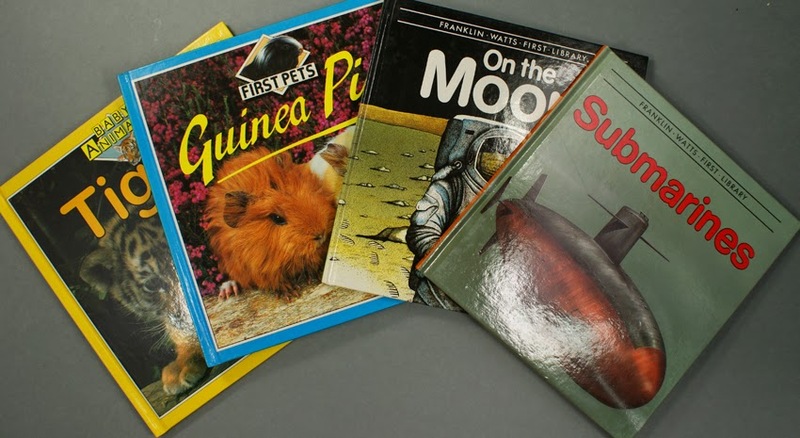 Her own writing career of children’s books began with a series of non-fiction titles for 5-8 year olds on subjects such as animals, transport and planets. From this, she went on to write various non-fiction books specialising in the 5-8 age range. Kate is perhaps best known for her pop-up books. While working at Random House Publishers, she had the idea of writing a grammar book for children. Kate had always loved grammar as a child and together with illustrator Jennie Maizels and paper engineer Damian Johnston set about creating a book “as much fun as the wackiest of today’s ABCs” to fill a gap she felt was present in children’s education. 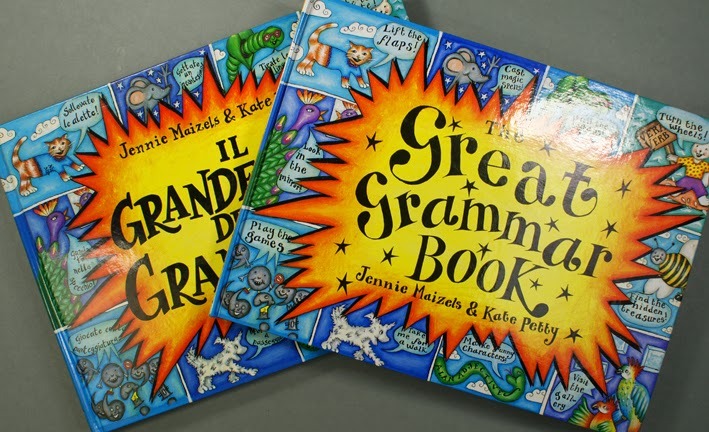 The Great Grammar Book, published in 1996, was an astounding success, providing a fun and interesting introduction to what is considered a dull and complicated subject, and it enjoyed many weeks on the Times Bestseller List. Kate and Jennie developed a strong friendship and together went on to produce a series of wonderfully detailed pop-up books full of intricate paper engineering and facts, ranging from music and science to the environment. Jennie’s preparatory work for many of the books can be found throughout the collection, as well as mock-ups of paper engineering mechanisms and dummy books. One book for which Seven Stories has some of her original rough artwork is The Global Garden. The Global Garden was published through the Eden Project for which Kate was the editor of the Children’s Publishing List, and won the Royal Society’s Aventis Prize for Science Books, Junior Prize 2006. In the collection here at Seven Stories we find a wonderful range of material, from the initial proposal with Transworld Publishers all the way through to the finished, published book. 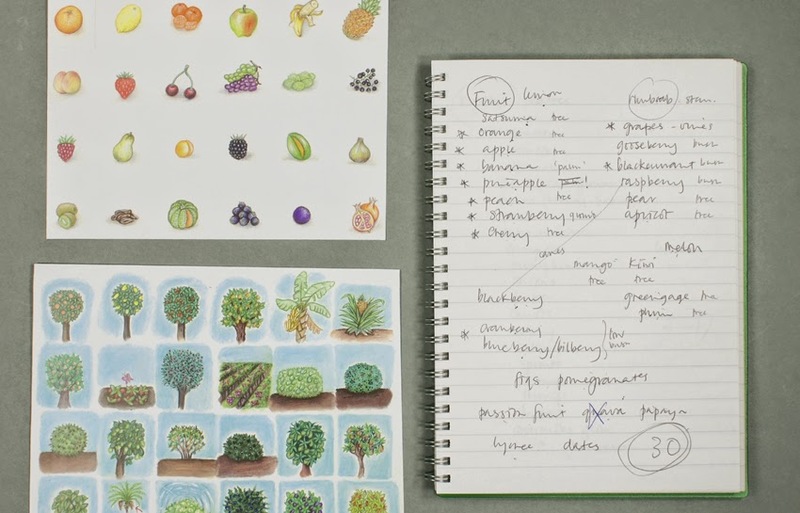 Kate’s notebook and numerous drafts alongside her rough layout sketches, Jennie’s artwork, and plans and draft work by the paper engineer for Global Garden, Corina Fletcher, provide an amazing look into how pop-up books are made. Aside from non-fiction, Kate also wrote what she called “soft non-fiction”, children’s books that were informative but used fictional characters, which created an engaging way for children to learn about and identify with topics such as road safety and bullying. She also wrote a small amount of fiction, most notably her teen novels Girls Like You, a series of eight books following the well-known struggles of eight different girls navigating life between childhood and becoming a teenager over a summer holiday. This series was compiled into two volumes by Dolphin/Orion Publishers: Summer Heat and Summer Cool. In Seven Stories’ book collection can be found two of these books which are particularly interesting. 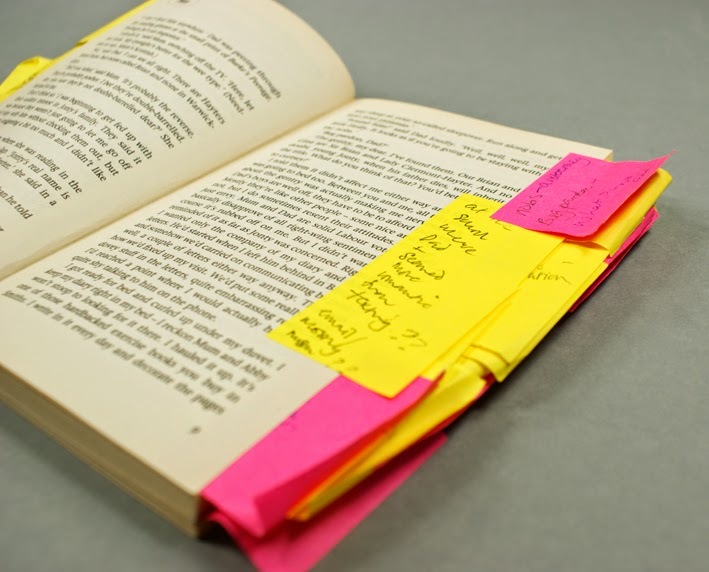 Also donated by Kate’s family, Holly and Alex are full of post-it notes on which are scribbled Kate’s own notes and edits she wanted made to the books. Some of the edits can be found in the compiled versions of the novels and are possibly the only evidence we have of these changes. 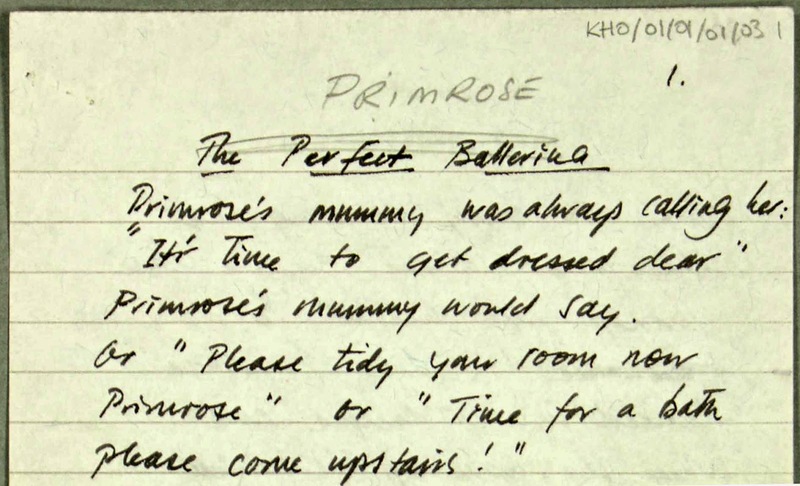 Among Kate’s handwriting we find that of another person’s, possibly her editor, and in a folder containing material for another of Kate’s teenage books, Makeover, we find letters written by teenage girls reviewing the book pre-publication. Here, and indeed with her non-fiction also, it is clear that Kate took great care with the research and realism of her work. Kate had a great talent for writing in such a way that was educational but never patronising or judgemental. The popularity of her books is evidenced by the fan mail she received from readers and teachers alike, and she is a sadly missed voice in the genre of children’s non-fiction. Winnie the Pooh, Noddy, Peter Rabbit, Paddington Bear and The Tiger who Came to Tea are all well-known children’s book characters who have featured in pop-up books. Popular figures or famous stories have often been published in pop-up editions – with varying results! 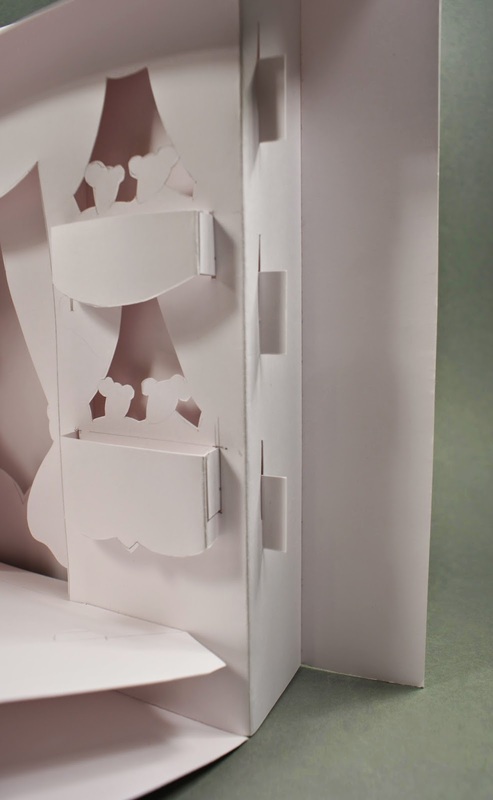 Pop-up books can be used to raise the popularity of a book or character. They can be used as a merchandising product (like soft toys or board games) and they’re a clever way for publishers to reuse already existent material. 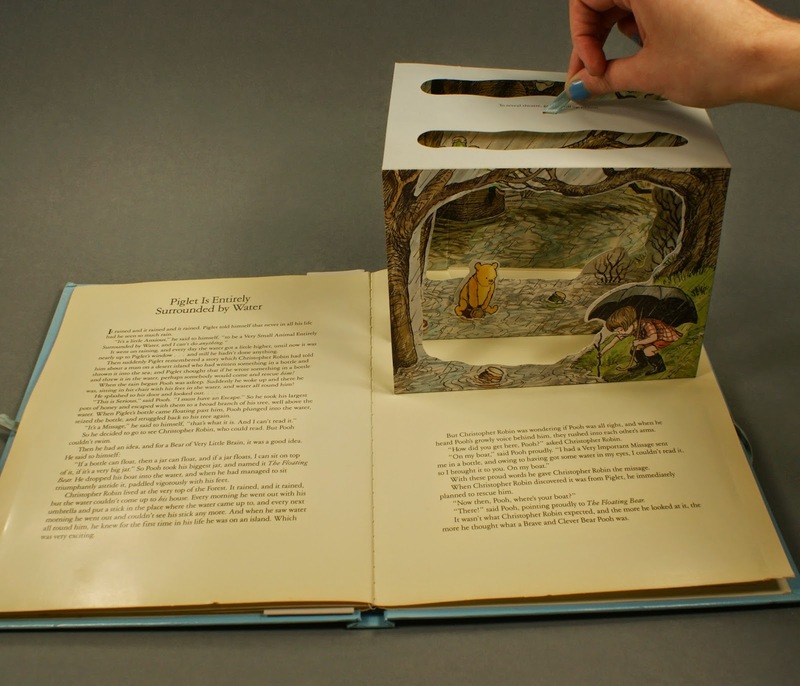 The reuse of established characters in pop-up books is not a new concept: as we saw in the last post, one of the key partnerships in the history of pop-up books was that between US publisher Blue Ribbon and the Walt Disney Company in the 1930s. 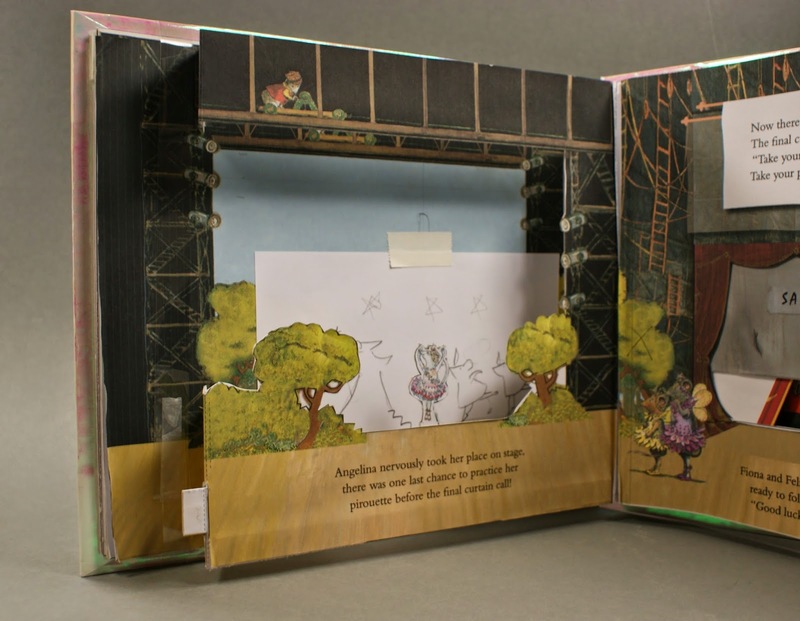 Pop-up books are a convenient medium to bring film characters or themes into a book version. The movement in the pages and the dynamics can fill the gap between a film and an ordinary book: like a film in a book format. However, pop-up books with well-known characters shouldn't only be seen as merchandising products. The results are very often quite exciting and it’s interesting how diverse the pop-up editions can be. 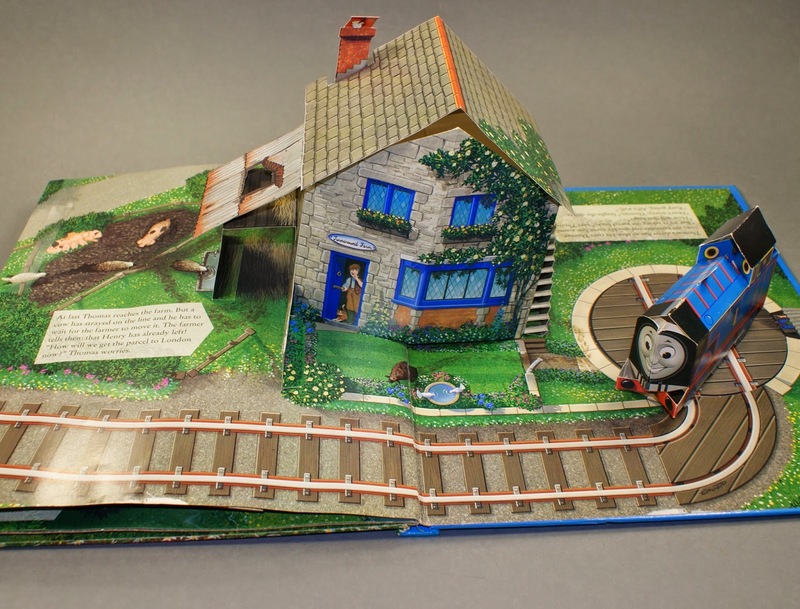 We can take a look at an example from the Seven Stories Collection: three Thomas the Tank Engine pop-up books produced in the 1990s. Thomas’s Party Pop-up (Heinemann, 1999) tells in five double-pages a short story about Thomas Birthday Party. The paper engineering is kept very simple and the technique of the pop-ups is always the same. The back of the book is located at the top. Each double-page contains a 90 degree pop-up-element which unfolds when you held the book in a 90 degree angle. Thomas's Big Railway Pop-up Book (Heinemann, 1992) features seven double-page spreads about seven adventures had by Thomas and his friends throughout a week. In contrast to Thomas’s Party Pop-up, this book includes different and complex paper engineering. All the included pop-up elements are 180 degree pop-ups, which work when the book is completely open. The reader is encouraged to turn the book in different directions to see all of the pop-up elements and there are many interactive pull-tabs. Two of the interactive elements feature string, which is used to demonstrate rope – the text says: “On Wednesday James runs away. Edward and an Inspector chase him and stop him with a rope.” The other string is integrated in a pull-tab, which makes it possible to lift the Tank Engine after an accident. Thomas’s Amazing Pop-Up Train Set Book (Heinemann, 1995) contains only four double pages, but the format has a bigger size than the other two books. This book contains detailed 180 degree pop-ups and there are many interactive elements – in particular, a detachable paper engineered Tank Engine, which can use for a free play with the book. The book is the base for the play as it contains railway lines, over which the Tank Engine can find the way (via a house and over a bridge) through the book. The story is told on little story-stops on every page: Thomas has to deliver a parcel in time, but is too late so he follows further story-stops which bring him back through the book till he catches a paper engineered helicopter which brings the parcel safe to his owner. The story and the interactive part with the detachable Tank Engine are cleverly combined and show another aspect of how pop-up elements can be used. The Thomas the Tank Engine examples show how different paper engineering can look and how different the functions of pop-up books can be. 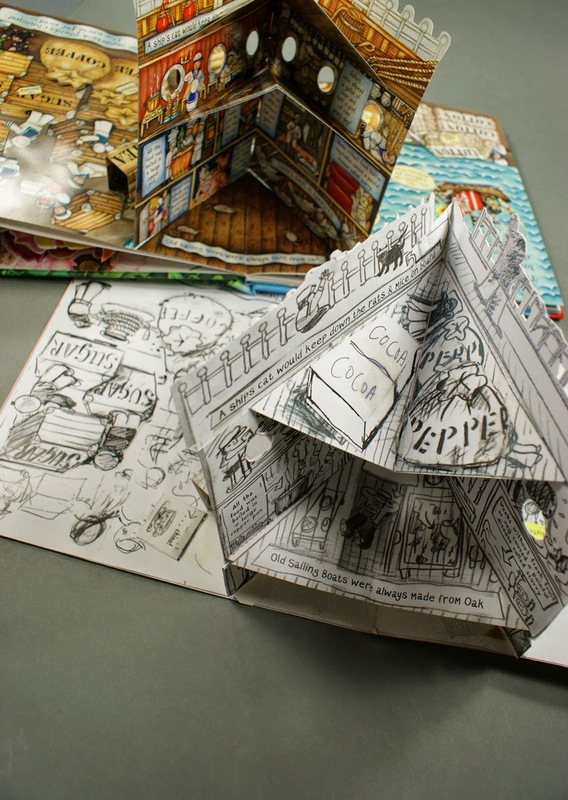 If pop-up books are cleverly made, they can make a story more alive and intensive. Interactive elements let the reader be part of the story and join in. 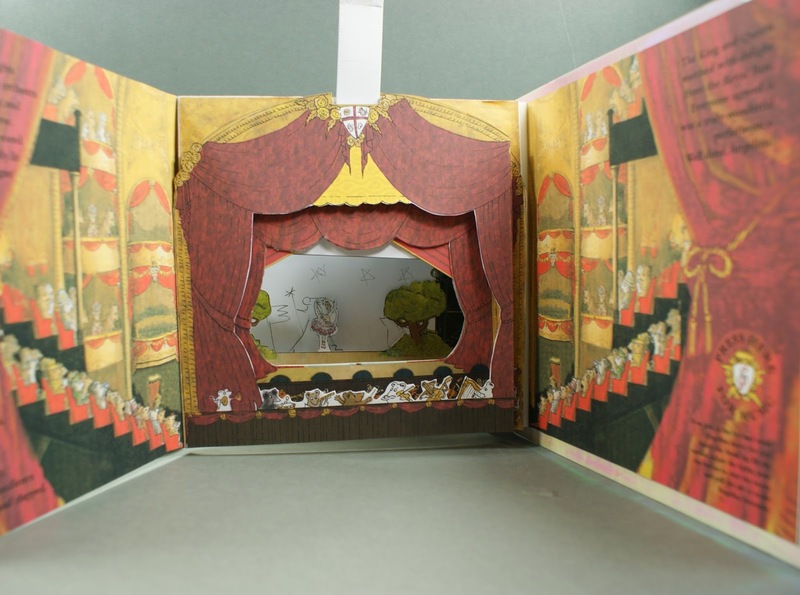 Other examples of innovative pop-ups featuring well-known characters include the Winnie-the-Pooh Pop-up Theatre Book (Methuen, 1992), for which the paper engineering was done by Helen Balmer and Jose R. Seminario. The book contains five double pages and every right side is covered by a big flap which can be lifted with a small ribbon. The enfolded paper engineering shows a scene of the story. With the included character puppets these scenes can be used for a free theatre play and pull-flaps bring movement to the scene. 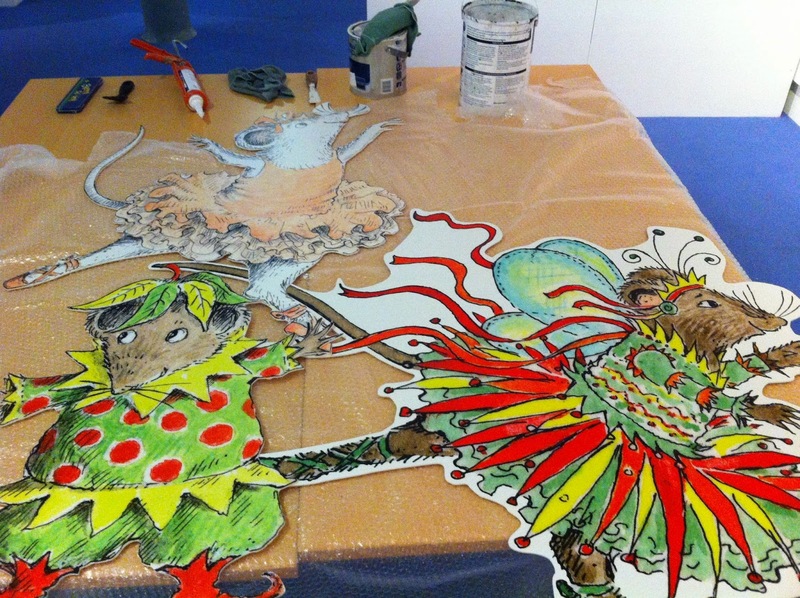 The amount of work required to make a pop-up book can be seen in the archive at Seven Stories. 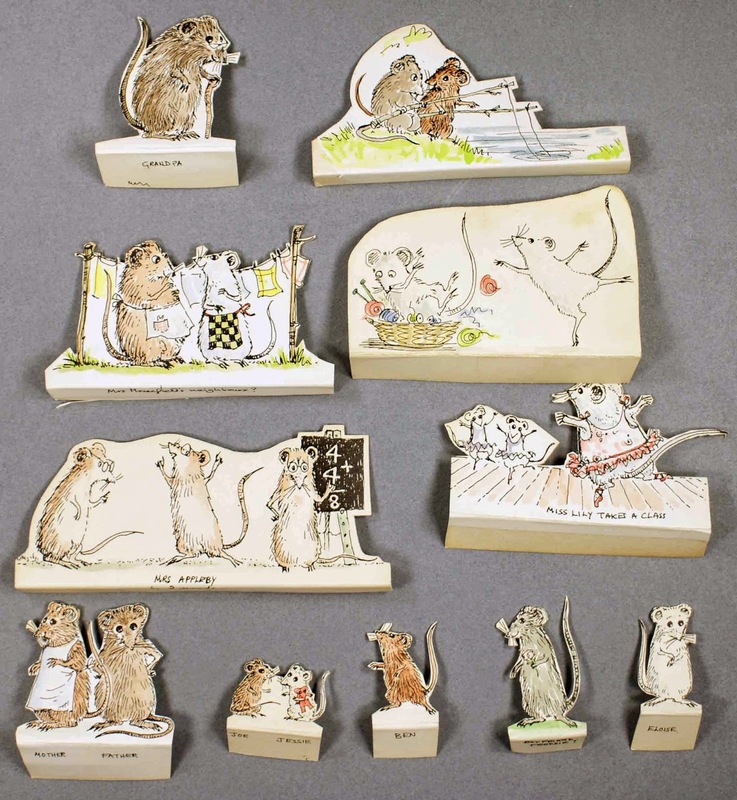 For example, Angelina Ballerina illustrator, Helen Craig’s collection includes extensive material from two Angelina pop-up books. 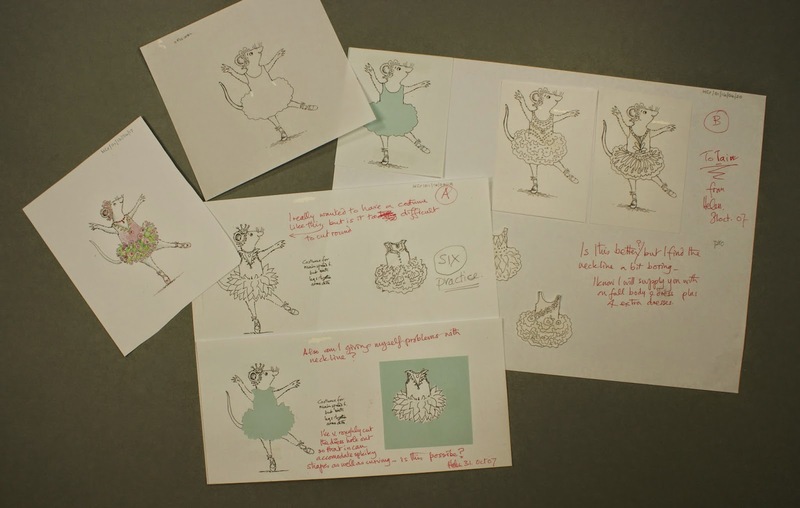 This material shows the entire process of the development of a pop-up-book, in this case Angelina Ballerina’s Pop-up and Play Musical Theatre (Penguin, 2008) and Angelina Ballerina’s Pop-up Dancing School (Puffin, 2007). 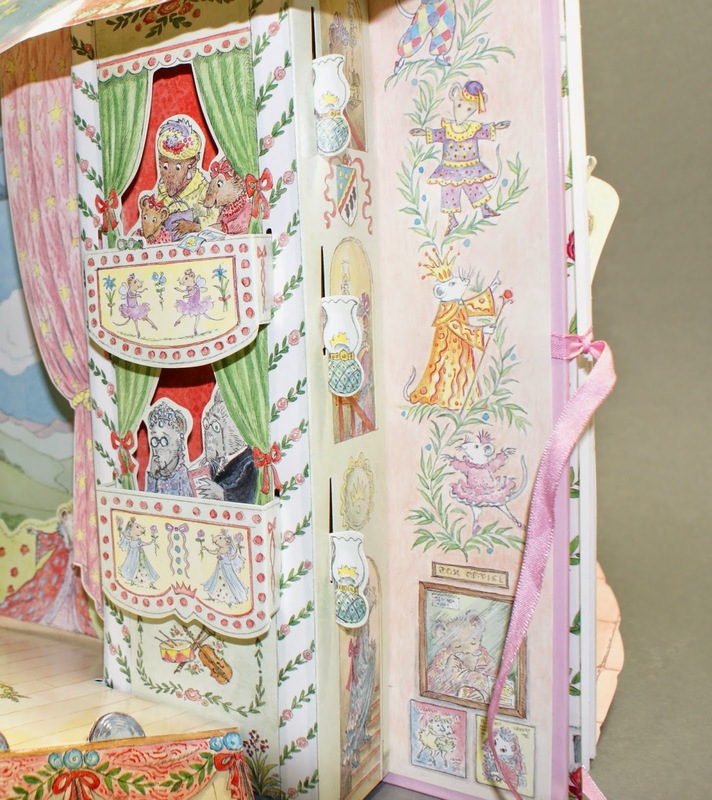 Looking at this archive, we can see that the production of a pop-up-book is very different to that of a normal book. The Angelina Ballerina material shows how important and precise the arrangements between the illustrator and the paper engineer must be. 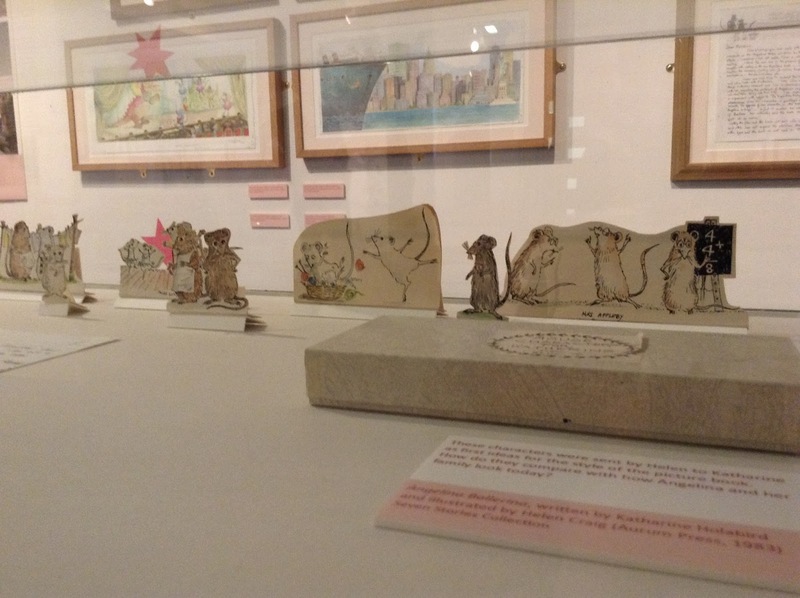 Helen Craig’s collection includes paper engineering dummies of different stages, original illustrations, work plans about necessary illustration parts, letters, emails and many designs and construction sheets with handwritten comments by Helen and paper engineers Ian Smith and Maggie Bateson. In their correspondence they talk about things such as the right sizes of the illustrations, so that they fit perfectly on a particular flap. In one email exchange they speak about the size of miniature coat hangers so that the press-out clothes hold perfectly on the small clothes rail! The dummies seem to be a very important resource for this process. They make it understandable for the illustrator which areas can be seen at the end and which illustrations or added decorations are needed, so that at the end a wonderful pop-up book can be published. The creation of pop-up books and bringing well-known characters into this new format demands a lot of creativity and knowledge. A successful pop-up-book that can offer something interesting and different to a traditional book is much more than a simple reuse of existing characters and illustrations. It can be an exciting new artwork. Pop-up books provide multifarious opportunities to create something special and new with already well-known characters and stories.